Harbor seal photographed by Andreas Trepte. Available through a Creative Commons Attribution Share Alike 2.5 license. Wildlife that are constantly exposed to humans have ways of becoming accustomed to our presence. 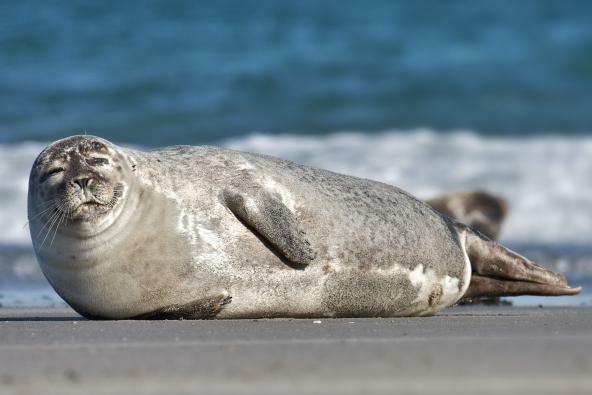 Harbor seals, for example, are known to alter their behavior in busy areas like marinas and are less likely to flush into the water in response to passing vessels. This reduced response over time is known as habituation and is often thought of as a harmless or even beneficial response to humans. Our study, however, suggests that this seemingly innocuous tolerance of humans may actually have negative impacts. We conducted behavioral observations at six harbor seal haul-out sites in the Salish Sea spanning a wide range of exposure to humans and found that seals were less vigilant to the presence of bald eagles (an opportunistic predator of harbor seal pups) at sites with high levels of boat traffic compared to seals at haul-out sites with minimal boat traffic. We believe these findings provide some of the first evidence to support the hypothesis that habituation to humans reduces aversion to natural predators in the wild. Although harbor seals populations in the Salish Sea are healthy, our findings could have broad management implications for less healthy or less resilient prey species and, with the help of additional long-term studies, may necessitate stricter guidelines for industries that rely on this process as a means of observing wildlife. Olson, J.K and Acevedo-Gutiérrez, A. (2017). Influence of Human Exposure on the Anti-Predator Response of Harbor Seals (Phoca vitulina). Aquatic Mammals. DOI: https://doi.org/10.1578/AM.43.6.2017.673.